Now, Trek captain Alex Kurtzman is pulling back the curtain on the upcoming project, revealing that a cataclysmic event depicted in J.J. Abrams' 2009 Star Trek movie impacted Picard in a big way. In that film, written by Kurtzman and former producing partner Roberto Orci, it was revealed that Nimoy's Spock failed to save the Romulan homeworld Romulus from a supernova several years after the events of Nemesis. Now, Kurtzman — as part of a Creative Space interview with The Hollywood Reporter (posting Wednesday) — is ready to reveal one massive clue about the premise of his CBS All Access Picard effort, due in late 2019: "Picard's life was radically altered by the dissolution of the Romulan Empire," Kurtzman tells THR. The Picard series will be the first onscreen Trek story set in the aftermath of that event, which would have altered the balance of power in the galaxy. The destruction of Romulus would also have extra resonance for Picard, who has a long and complicated relationship with the Romulans, the alien race that split from Vulcan society thousands of years ago and founded a separate civilization. The Romulans went on to control a portion of the galaxy, and the empire was in opposition to the Federation for all of Picard's career. Kurtzman says Stewart agreed to return only if he could defy what people are used to seeing with Trek. "He threw down an amazing gauntlet and said, 'If we do this, I want it to be so different, I want it to be both what people remember but also not what they're expecting at all, otherwise why do it?' " Kurtzman recalls of their initial discussions for what would become the highly anticipated CBS All Access series. That was part of a long journey to woo Stewart back to the role that began more than a year ago. I have no idea what I am supposed to be expecting from Trek. Oh god, they're following that timeline? Well technically it's part of the Prime timeline. That said, had they simply decided that it had never happened I would have been just fine with that. Graham Kennedy wrote: Well technically it's part of the Prime timeline. That said, had they simply decided that it had never happened I would have been just fine with that. Bryan Moore wrote: Oh god, they're following that timeline? All I ask is a tall ship, and a star to steer her by. Graham is right, that IS Prime timeline, but as lamented in my "Abrams-verse" post in regards to that universe likely being permanently shelved, not just on hiatus... The whole lead up to the event that created the separation in universe is utterly awful, dictated by comic books and Star Trek Online while the official accounts leading to 2009 Trek in the backstage sources forced it to be canon. What a freaking mess that is. I'll be missing this series during the first run, sadly... but will be curious to check it out when available. Well... We at least know that will not be TNG part 2... maybe a more reasoned version of Star Trek Online? Joking, it's Kurtzman who helm that. 1) Starfleet Admiral, possibly Chief of Starfleet. 2) Commandant of Starfleet Academy. 3) Left Starfleet, now an Ambassador or other high ranking diplomat. 4) Left Starfleet, now a teacher. 5) Left Starfleet, now an archeologist. Here's a question. How do people feel about this show, right now? Are you excited for it? Are you hopeful about it? Nervous? I have to say, honestly I feel kind of gloomy. I expect that they will mess the show up. I expect that they will mess Picard's character up. I might be wrong, I certainly hope I am wrong, but I'll honestly be shocked if this is any good. Left Starfleet, now picking grapes. Starfleet gets him to come back by informing him that a person from his past, that we've never seen, is in trouble, kidnapped/imprisoned/set for execution by an enigmatic alien species, with vague warrior-culture beliefs, and only Picard has experience with these people through this mutual friend, so he's the "best option" Starfleet's got. Sorry for my cynicism. I'm intrigued and looking forward to it. I dunno. Just got a feeling, mostly. I am skeptical about Kurtzman and the continuation of that arc. Stewart himself could portray Picard as a born-again Christian circus clown bent on uniting the galaxy through the love of Christ and balloon animal Borg and my office desk would still rise six inches as I sit and watch... Truly looking forward to seeing Picard one more time. I've heard some people are concerned that Picard will be like Luke from The Last Jedi. Also someone thinks that if Harry Kim shows up in this, he will still be an ensign. No radical alterations for him. 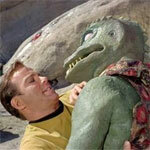 Nutso wrote: I've heard some people are concerned that Picard will be like Luke from The Last Jedi. After The Last Jedi, I think it's a fear in the mind of everyone when an iconic character is announced to return, the talk here illustrate it. But Steward seems enthusiast when Mark Hamill clearly said he didn't recognised the character so maybe we can hope it will be watchable at least. If it’s to be a radically-altered Picard, why have it be Picard?